Every detail needs to be perfect. When hospitality and comfort is paramount, UltraLav trailers provide all the amenities of home and leave a lasting impression on your visitors. Since our trailers can be easily configured for leisurely uses like temporary bathrooms or more serious applications, we’ve quickly built a reputation of exceeding expectations and long-lasting dependability. UltraLav mobile restrooms range from petite 1-stall units for small gatherings to impressive 10-stall units for larger venues – the choice is yours. UltraLav mobile showers can be configured for leisurely uses like temporary locker rooms or more serious applications. UltraLav ADA units are not just handicap accessible, but ADA compliant, meeting or exceeding the permanent structure criteria as specified by the Americans with Disabilities Act. The UltraLav ADA series is specifically designed to accommodate the unique needs of disabled users. UltraLav ADA units are not just accessible, but ADA compliant, meeting or exceeding the permanent structure criteria as specified by the American Disabilities Act. Plus, everything you need to set-up including the railing/ramp assembly are totally self-contained. No need for separate storage units or another tow vehicle. This amazing engineering feat is accomplished by our exclusive and proprietary “one-touch” hydraulic trailer lowering system. The entire trailer smoothly and quietly lowers to the ground making long and cumbersome ramps obsolete. 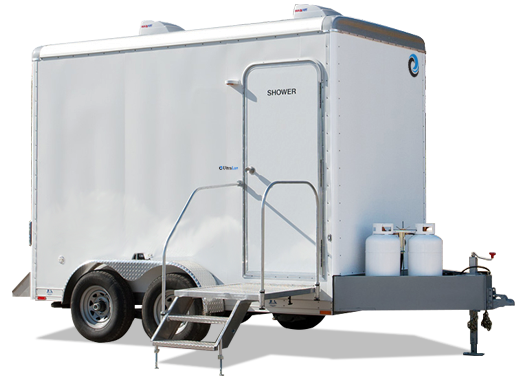 Our smallest mobile restroom trailer, the UltraLav 2-Stall, features 2 fully self-contained restrooms. The small footprint makes the UltraLav 2-Stall the perfect choice for small or remotely located special events, and works great in small construction sites. Popular options for the UltraLav 2-Stall include the on-board battery system providing an estimated 18 hours of continuous operation. Big events mean big business and the UltraLav® Multi-Stall is up to the challenge. With 5 fully self-contained restrooms (4 women’s cubes and 2 men’s cubes) long lines are minimized. Its massive 750 gallon waste capacitywill deliver 2100+ flushes. Unlike other restroom trailers on the market, the UltraLav® Multi-Stall offers complete privacy; no stalls or side-by-side urinals. The attactive interiors are easy on the eyes while the simple and quick set-up is easy on your schedule.